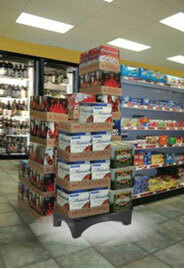 SureStack™ Dunnage Racks keep products off the floor, safe, sanitary & saleable. Blueberry Brands SureStack™ Dunnage Rack is the best alternative to aluminum and other plastic racks available on the market due to its ergonomic design, sanitary features, innovative fabrication, strong weight capabilities and durability. 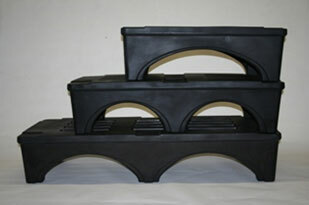 Please go to dunnage-racks.com to see a full range of dunnage rack products. 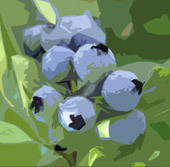 Blueberry Brands, LLC # PDR-2030. Size: 48 inches W x 36 inches D x 12 inches H.
Dunnage Racks from Blueberry Brands, LLC. Use for in-store merchandising, in beer caves, walk-in coolers, back rooms, storage and food preparation areas.. and, 100s of other places. UV resistant, durable plastic construction. Use outside at store entrance or on forecourt. Temperature resistant: -20F to 180F. Attractive, functional arch design feature. Black is standard. Other colors available.. please call for more information. Yes, we can add your logo, name or any graphics you wish.